Blogging about Islay without mentioning the whisky distilleries wouldn't be complete, time for the first entry about a distillery: As this is a new blog it is only fitting to write about a new distillery, Kilchoman Distillery. The distillery is the first new distillery on Islay for 124 years, rejuvenating the old tradition of a farmhouse distillery and reversing industrial revolution with its mass production. It has generated quite a lot of press, including a long feature in the Food & Drink section of The Independent. 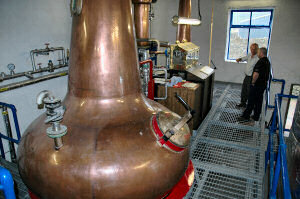 I have only visited Kilchoman Distillery once so far in Summer 2005, also using some of the pictures from the visit on my page about new and reopened distilleries on Islay. This was before the distillery was finished and started production, I hope to visit it again this summer to see it working. Unfortunately they had a fire earlier this year (picture of the Kilchoman fire damage, see also further pictures of Kilchoman), luckily the fire was contained fairly quickly and the damage limited. As far as I know they don't expect much impact to production and were working with the maltings in Port Ellen to ensure supply to continue distilling.